1) The neck region, or cervical spine, made up of 7 vertebrae – where the vertebrae curve forward. 2) The trunk region, or thoracic spine, made up of 12 vertebrae – where the vertebral column curves backward, and to which the ribs attach. 3) The lower back region, or lumbar spine, made up of 5 vertebrae – which curves forward in the same direction as the cervical spine. When these curves are in their normal alignment, the body is in a balanced position. This distributes weight evenly throughout the vertebrae so they are in a less vulnerable position for strain and injury. 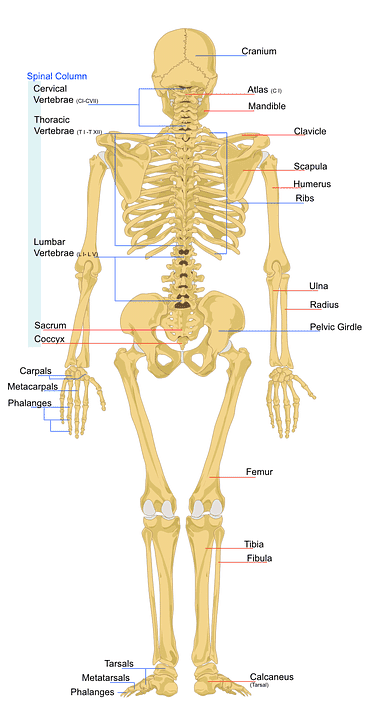 The human spine, which connects the skull to the pelvis, is also called the vertebral column. The vertebral column comprises 24 segments of block-shaped bone called vertebrae and an additional 9 fused vertebrae that make up the lowest part of the human spine, the sacrum and tailbone. Each vertebrae of the vertebral column has protruding bony areas for the attachment of muscles that are essential for the movement of the spine and the rest of the body. 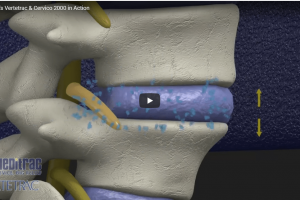 Between each vertebra are spongy but tough cushions called discs that act as shock absorbers. It is the discs that afford the flexibility in the spine. Conversely, damaged discs usually cause pain and stiffness, and less flexibility making it harder to bend. The vertebral column protects the spinal cord and its emerging nerves that run down most of the length of the spine. The spinal cord is the mass of nerves that connect the brain to the rest of the body. The vertebrae have two major functions: to bear the weight of the body, and to house the spinal cord or spinal nerve roots (also known as cauda equina) within the spinal column. There are two major parts to each vertebra, the vertebral body and the vertebral arch. The vertebral body is the front portion of the vertebrae. It is shaped like a cylinder and is greater in height than the back portion. The vertebral arch is the back portion of the vertebrae. It is an irregularly shaped structure. that are important for the stability and movement of the spine. On the back part of the vertebrae are two upper and two lower processes that form the joints connecting the back part of each vertebra. These are the facet joints. They are important for movement between each vertebra and for movements of the entire vertebral column as a unit. 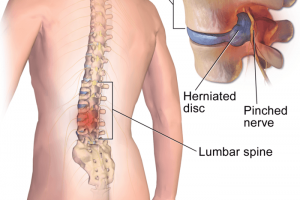 disc with the attached part of the vertebra above and below is considered an inter-vertebral joint. These joints allow for the movement of the back. Healthy discs are elastic and springy. They make up 20% to 25% of the total length of the vertebral column. Initially, the disc contains about 85% to 90% water, which is why it is so elastic. However, this amount decreases to 65% with age, resulting in disc degeneration. body. Various nerve roots combine to form spinal nerves. There are five pairs of lumbar (lower back) spinal nerves. The nerve roots that arise from the end of the spinal cord and continue down the spinal canal through the lower part of the human spine looks like a “horse’s tail”. Exercise – the right kind of exercise! A lot of abs reducing exercise can hurt our backs if not implemented correctly or if we concentrate too much on one part of our body and forget to exercise the other parts, creating an imbalance. Yoga – but with supervision! Some people actually manage to hurt their backs doing certain yoga moves before their body has been conditioned to tolerate these moves. 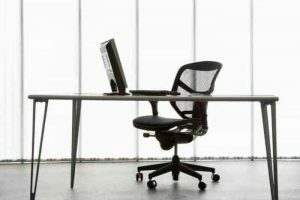 Sitting posture – check you are sitting on a chair that supports your back and the kind of work you are doing. Stretch – never sit for long periods, stretch periodically. The ‘cat & camel’ exercise, rocking hips and child’s pose are particularly useful. Walking – try to walk around 10,000 steps every day (around 5 miles or 8 km!). If you can’t manage that, try a minimum of 30 minutes at a comfortable pace that is beyond a stroll. Food – make sure you avoid refined sugar or too much salt in your food. Try to make food from scratch so you can monitor the ingredients. Shop bought sauces are often high in sugar, fat and salt content. Diet – if you have a ‘spare tire’ or ‘middle-aged spread’ around you waist, try to reduce it – having to carry that weight on your spine will create back ache. Massage – getting a back massage with oils can relax muscle spasms and tense muscles. Hydrotherapy – swimming or exercising in a pool of water can help to relax your muscles. Lifting – whenever you lift something, make sure you lift it correctly, bending your knees. If you need to lift something heavy, wear a belt. Smoking – you know smoking isn’t good for your lungs – well, news flash – it isn’t good for your discs and joints either. Drinking water – try to drink at least 1.5 litres of water daily, more on hot days. Drinking coffee or coke – try to reduce your caffeine intake as caffeine dehydrates your body. Every time you have a cup of coffee or glass of coke, make sure you drink a glass of water afterwards. Vertetrac* – mobile spinal decompression (traction) device for lower back pain. Cervico 2000* – mobile spinal decompression (traction) device for neck pain. PainShield* – therapeutic ultrasound device for neuromuscular pain, muscle spasm pain and bone fracture pain. WoundShield* – therapeutic ultrasound device for wound-related pain, accelerating the tissue healing process, even in hard-to-heal wounds such as diabetic ulcers and pressure sores. UroShield* – therapeutic ultrasound device for indwelling urinary catheter related pain for pain reduction and risk of infection reduction. The Cervico 2000, Vertetrac, PainShield, WoundShield and UroShield are sold in Bahrain, Iran, Iraq, Kuwait, Oman, Qatar, Saudi Arabia, and the United Arab Emirates via MediSpera.com. Contact us here for more information.